Topics covered in this Grade 8 curriculum include: types of sentences, capitalization, prepositions, diagramming, active or passive voice, personal pronouns, adjectives, irregular verbs, appositives, the colon, italics, and more. This kit includes a Student Textbook with approximately 111 lessons, a Student Workbook, and a Teacher's Guide that includes answer keys and tests. The program consists of daily lessons, review sets, and tests that are sequenced to build skills and concepts. 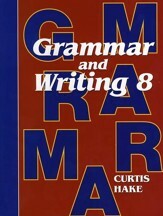 The Student Text is written directly to the student and provides instruction on key grammar and usage concepts with bolded words and examples; writing exercises are given daily. The workbook provides additional practice opportunities and opportunities for assessment. The Teacher's Guide includes answers and test blackline masters, as well as a class schedule. 1 Teacher Guide, 246 pages, softcover, 2nd Edition. 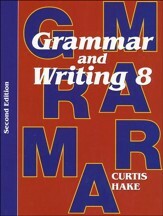 1 Student Text, 717 pages, 111 lessons indexed, softcover, 2nd Edition. 1 Student Workbook, 140 pages, softcover, 2nd Edition. This Grade 8 Saxon Grammar's Student Textbook contains 111 lessons and is written directly to the student. Developed to follow the classic Saxon model of incremental development and continuous review, lessons instruct students on a basic skill before moving on to examples, practice exercises, and review sets. Providing instruction on key grammar and usage concepts with bolded vocabulary and thorough examples, writing exercises are also included to help guide students through composing a complete essay. Journaling and dictation exercises help hone different writing skills. Topics covered in this Grade 8 text include types of sentences, capitalization, action verbs, pronouns, adjectives, nouns, subject-verb agreement, the semicolon, infinitives, parallel structures, interjections, and more. 717 pages, indexed, softcover. 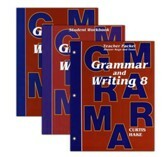 This Saxon Grammar Teacher's Guide accompanies the Grade 8 Student Workbook and the Grade 8 Student Text. It includes a short message to the teacher, schedule, a complete set of answer keys (for the textbook practice and review sets, writing lessons, tests, and more practice worksheets), and test masters. 246 pages, softcover. 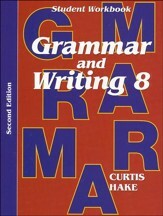 This workbook accompanies Saxon Grammar's Grade 8 Student Text. Writing lessons instruct students in the elements and writing of persuasive, descriptive, & expository essays, research papers, personal narratives, and standard essays; "More Practice Lessons" accompany many of the chapters in the student text with supplementary exercises. 140 pages, softcover. This kit includes a Student Textbook with approximately 110 lessons, a Student Workbook, and a Teacher Packet. 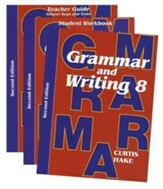 The Student Text is written directly to the student and provides instruction on key grammar and usage concepts with bolded words and examples; writing exercises are given daily while the workbook provides additional practice opportunities. The Teacher package includes answers and test blackline masters, as well as a class schedule. The Teacher Packet includes a short message to the teacher, schedule, a complete set of answer keys (for the textbook practice and review sets, writing lessons, tests, and more practice worksheets), and test masters. Tests and writing lessons are designed to be administered every 5 lessons (after the first 10). Teacher book is softcover. 1 Student Text, 715 pages, 111 lessons indexed, softcover. 1 Student Workbook, 133 pages, softcover. 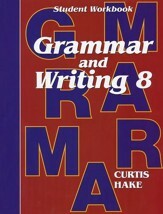 This teacher's guide accompanies Saxon Grammar's Grade 8 Student Text and Grade 8 Student Workbook. This Teacher's Packet includes a short message to the teacher, schedule, a complete set of answer keys (for the textbook practice and review sets, writing lessons, tests, and more practice worksheets), and test masters. Tests and writing lessons are designed to be administered every 5 lessons (after the first 10). Softcover. This Saxon Grammar's Student Textbook contains 111 lessons and is written directly to the student. Providing instruction on key grammar and usage concepts with bolded words and examples, writing exercises are also included to help guide students through composing a complete essay. Journaling and dictation exercises help hone different writing skills. 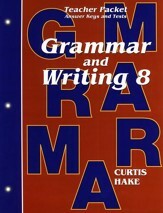 Topics covered in this Grade 8 text include types of sentences, nouns, helping verbs, future tense, irregular nouns & verbs, prepositions, pronouns, proofreading symbols, diagramming, adverbs, punctuation, subject-verb agreement, clauses, spelling rules, and more. 715 pages, indexed, softcover. This student workbook accompanies Saxon Grammar's Grade 8 Student Text. Writing lessons help review and provide additional instruction in writing persuasive & expository essays, research papers, personal narratives, and standard essays; "More Practice Lessons" accompany many of the chapters in the student text with supplementary exercises. 133 pages, softcover.